Sitka Art Circles are a way to come together in a casual atmosphere and have a bit of artistic fun. Everyone is welcome! Light, paper, chemicals and sun combine to create beautiful blue and white prints of nature. This playful approach to image making will yield surprising results. As a group we will collect leaves, grasses and other natural elements from the ground. 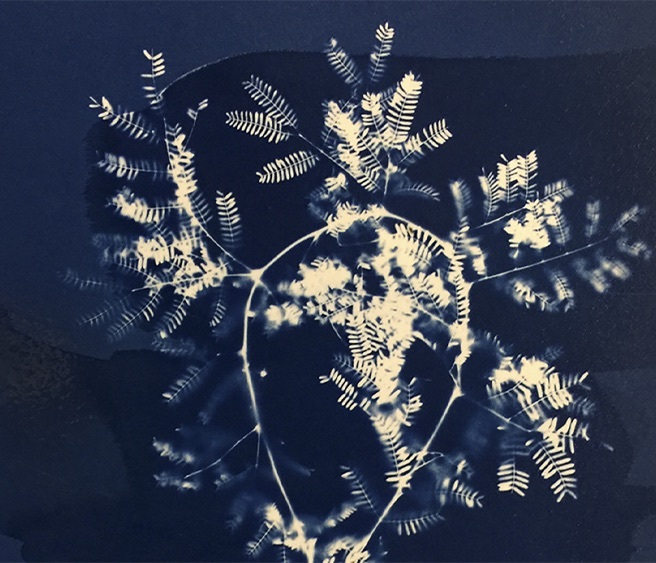 You will learn to hand coat paper with the cyanotype chemicals and, once dry, make photograms by placing the collected items on the paper and exposing them to sunlight. Each print will be unique. Karen Hymer is a visual artist and educator from Tucson, Arizona. She holds BFA, MA and MFA degrees in Fine Art Photography and has taught for over 25 years. She sees teaching as an opportunity to present new ways of experiencing the world through interaction with nature and image making. Karen’s current work explores the effects of time on the human body and various plant life. Her richly detailed photogravures emphasize the interplay of texture, pattern, light and shadow in muted earth tones. Her images are visually seductive; a poetic beauty is revealed in often overlooked subjects.